I am a graphic designer living in Seinäjoki in Finland and working in an inspirational creative agency. Follow me on Instagram. We’re bringing new life to poster art! 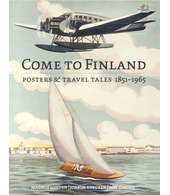 Pekka Kurki is a part of Come to Finland’s effort to create a renaissance for the almost forgotten genre of poster art. Make reality of your own, or your business’, poster idea through Come to Finland. Mail us at posters@cometofinland.fi – together we’ll let creativity flourish!